A few weeks before Christmas Aldi supermarket were advertising the Medion Lifetab E7316 (MD 98282) 7″ Android 4.2.2 tablet at a very reasonable price of £79.99. This was one of their usual weeks specials and was going on sale on the Sunday. I hadn’t seen the special flyer or email from Aldi but had seen reviews in the major newspapers, as at the time we needed 2 new tablets for the girls for Xmas, so instead of ordering from eBay I thought these tablets would be better. So on that Sunday we went to our local Aldi in Brownhills for about 10mins before they had opened, but there was already about 20 people in front of us in the queue, so we knew this was going to be a popular item just before Christmas. As soon as the door opened we went straight to the till and asked for 2 of these tablets and we got them, it was then announced they had sold all this stores allocation of these tablets, the staff then told us they had only had 5 of these tablets for sale. Now I realize stores have limited stock of offers but only 5 in stock for a reasonable sized store is too little, as their was a lot of disappointed people who wanted these tablets, considering the reviews in a fair few major magazines and not just adverts, this was shocking to have only that amount per store as the reviews before the tablet when on sale made out this was going to be a continuous offer, not just for one day. No wonder the newspapers wrote about the tablet selling out in just one day. 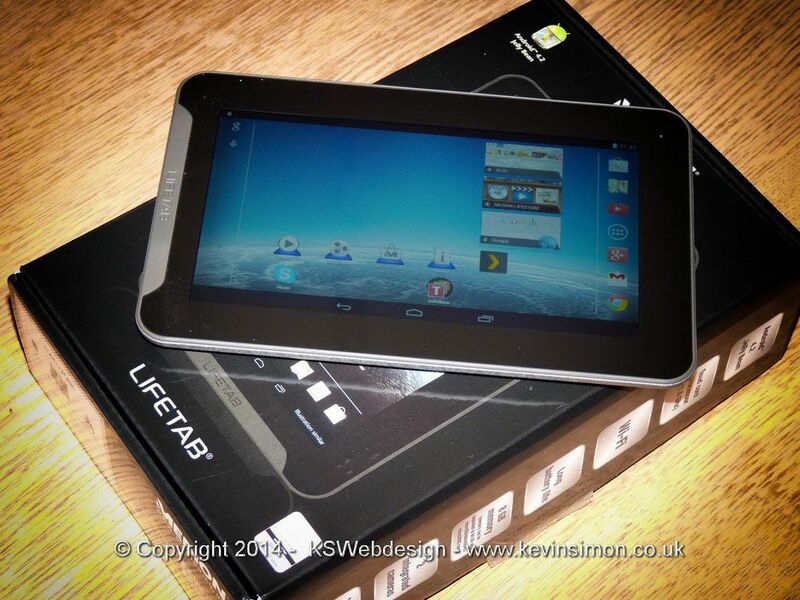 Now back to the main reason for writing this article a full hands on review of this Medion Lifetab E7316 7″ tablet. Once we got these tablet I set each one up with the girls Google accounts, apps they normally use, games, notepads, plex media streaming (see HERE for more info on plex) so I had a few hours to use the tablet myself before they had them for Christmas day. The initial setup of the tablet was easy, once setup the Google account, it then configured the preinstalled apps, which there are a fair few bloatware apps Inc of cause the Aldi app, eBay, a 30day free trail of kaspersky tablet security, Hrs hotels, and a good few others, I uninstalled the above apps, but did leave some useful apps like drawing pad, softmaker office suite and the Medion lifeplayer media players. The others are the standard Google apps that are preinstalled on any Android 4.2 jelly bean device. One of the first apps I installed antutu benchmark software to get a rating of the overall speed of the devices, the score came out at just over 20,000 now a galaxy S3 is around 16,500 and my dual core sumvision 10.1 comes out around 14,000 so this is a very good speed for a tablet of this price. This is due to the quad core 1.6ghz cpu and installed 1gb of DDR3 ram, so really a nice and fast little tablet. I found the display to be clear even though low for modern 7″ tablets at 1024 x 600, photos looked very vibrant and bright, the brightness can be used at its lowest level and still produce good results, I played some 480p and 720p MP4 videos streaming over our network without any problems. With 8gb installed storage memory you have enough to load a fair bit of media as well as loads of apps. Though as usual you can install micro sd cards to expand storage, I used a 16gb class 6 microsd card with no problems. Once the girls had them for Christmas they then put on some of the other apps and games they like, so now a week after having the tablets I can say what they have been like in normal use, they have found the battery to last reasonably well, from a full charge they can easily get a full day of using for games, Facebook, Internet and ebook reading, so I would say the battery does last as Medion do state for up to 4hrs continuous use. Though like any device adjusting the brightness and turning off bluetooth and wifi does really help your battery last longer. On the tablet you have power button, volume buttons, microsd slot, micro usb for charging and connecting to pc for transfer of data etc, though the tablet doesn’t have a mini hdmi out which is a pity as sometimes useful to connect to TV / monitor to display content on a large screen, though I haven’t fully looked if there is any sort of adapter to go from the micro usb to hdmi. You do have two cameras on the device one front facing and one on the rear, the front facing camera is OK for video calling like using Skype but the rear one even though it’s says it of a 2mp quality the results are not the good, would be OK for taking photos of notes and quick snaps but not for anything else, but again why would you want to take photos using a tablet instead of a normal compact camera that would have better spec than cameras built into most tablets and easier to hold. The wifi range seemed OK and the weight is reasonable at 310 grams the full size of the unit is 192 x 122 x 10.8 mm so feels OK to hold using one hand. So my final thought is this is a good tablet for the money though not sure if Aldi will have them back in stock if the do I would recommend getting one as a quick tablet and good display for under a £100, and really had no reliability problems though one of the tablets locked up once, but the was when streaming video on our home network while I was messing with our server, if it does lock up remember you do have a reset button on the bottom that you can use a pin to reset the tablet (this is like taking a battery out and the back in again) though if you can’t get one there are a lots of other tablets of this spec around this price on the market, like a fair few good oem brands on eBay, and also consider the Tesco Hudl at £120. Sleek, multimedia tablet for work, music, apps and more, everywhere you go. Aldi are selling as their special buy for Thursday 27th March, the Medion Lifetab E7318 (MD 98691) at again £79.99, on the aldi supermarket website is says improved model for 2014, looking at the specs of this one the E7318 (MD 98691), the only difference in spec is the pre-installed memory up from 8gb to 16gb, but all the other specs are the same. So my review above would still be the same for this model, again if looking at getting this on Thursday I would recommend getting their early as I would say that stock levels would be about the same as the E7316 probably low to get you into the store to buy more. Just a quick amendment to this post as just had a quick play with the tesco hudl as someone brought one round, so here is my quick rundown of the specs and a basic review compared to the aldi tablet the hudl does have a slightly higher resolution display at 1400 x 900, the 7″ screen does look clear the CPU is a 1.5ghz quad core with Mali 400 gpu and the unit has 1gb of ram. Which is fine for general web use etc, did have a quick play in some games and seemed OK, though may struggle with high end 3d games the same as the medion tablet. I run antutu bench mark on the hudl tablet and came out with score of 18522, which is reasonable score. The tablet does come with preloaded Tesco software Inc several blinxbox apps for movies, music etc clubcard TV, groceries, store locator etc. You have access to the full play store to download apps and the same Google apps as any other android device. Movie playback was good. Brightness of the screen was very reasonable. So all in all a good value entry level tablet. It does charge from the micro USB as some entry level tablets don’t and have to use separate charger. So if you are reading this post and interesting in getting the medion tablet, which since got ours not seen them in aldi again, the Hudl would be great choice. As quick enough for most peoples needs, and also at £120, it reasonably priced also remember you can double up your clubcard points so if you got £60 in clubcard vouchers essentially you can get it for nothing. It is good value for money and a bit cheaper than Google nexus, Amazon kindle etc, though these are slightly higher spec on display etc. But the Tesco hudl is still a great table and would really recommend this tablet. I am new to using tablets and would appreciate your knowledge on my question please. I have bought today one of these Aldi tablets but before I open the box I wanted to check to make sure of the usage of this. Will I be able to use it to open all applications whilst I am travelling overseas eg in New Zealand. I called their helpline but the answer I got was non committal in other words was told it could work sometimes and maybe not other times so I am none of the wiser. I will be in NZ for some time hence wanting to make sure I can use it whilst there. I didn’t want to be saddled with taking my laptop so thought this would be a better bet for travelling to keep in contact with friends, family etc. if you want to keep in contact with family etc, you can get skype or other instant messaging services ie viber, facebook, whatsapp etc. If you want office apps you do have one preinstalled or get kingsoft office (free) or for just note taking i use jotterpad see HERE for my review. so if unsure have a look at the play store website for available apps, to be honest I use my android tablet though is a 10″ sunvision make which replaced a netbook pc for most of my work including all articles on this site. Hope this helps. Awesome. Many thanks for the reply. I’m not a technical person hence having the help to understand something new is very much appreciated. I will keep the tablet and look forward to opening the box now to start using and investigating. Hi, I have just bought Medion Lifetab E7318 so that I can play a couple of games with my friends/children. As yet I have not opened the tablet in case I want to take it back! Also Hayday which is not through Facebook.? Farmville even…. Also, was worried abut the length of battery charge as it seems to be only 4hrs but with games would think it would last considerably shorter length of time. Is it possible to get new batteries when these no longer take a charge or to get extra ones for when these are flat?? Sorry about all the questions, but answers would be very much appreciated…Many thanks. sorry, do these tablets do updates for games and Facebook and any other programmes that one installs? Thanks for the info, but on further investigation I decided it’s not what was really wanted and I returned it to shop! Got a Lenovo Yoga 8 tablet instead which seems fine at the moment so I hope it will remain so! We purchased three sets of tablets E7318 (MD 98691) The screen in the 3 sets broke, so the touch would not work and I was informed that the 3 years warranty would not cover the faulty brittle screen. On the other hand I purchased 2 Apple tablets one for me and one for my wife few years ago they look bra new. Expensive but first class quality. Conclusion: I will never buy any electronic item from Aldi due to the bad experience with the Lab tops and tablets, simply cheep and nasty.